There are several ways to measure the quality of the water in a water body. Traditionally this has been undertaken through a combination of a visual inspection and chemical testing by analysing the water for dissolved oxygen levels and a range of chemical pollutants. 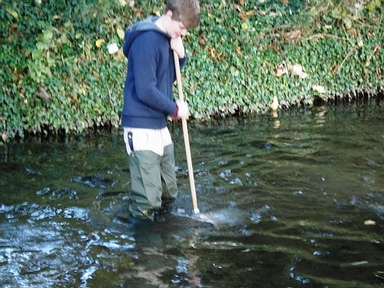 Recent methods for measuring water quality is to use Biological monitoring techniques by looking at the invertebrate populations present within the water course. A wide variety of invertebrates live in rivers and streams including worms, snails, leeches, fly larvae, crayfish and shrimp. These invertebrates differ in their tolerance to different pollutants, so by identifying which species are present we can determine how clean the water is. Their common characteristics of limited mobility, relatively long life cycle, presence throughout the year and specific tolerances to changes in environmental conditions make them powerful biological indicators for monitoring water quality, therefore a good measure of the health of a water body is the amount of invertebrates’ present living in it. The term Riverfly is one that encompasses three groups of insects; Mayflies, Caddisflies and Stoneflies. Riverflies, along with other freshwater invertebrates, live their lives as larvae on the bed of our rivers, streams and lakes, emerging as adult flies during spring and summer. They are at the heart of the freshwater ecosystem and are a vital link in the aquatic food chain as a source of food for fish and birds. For more information on river creatures see The Wear Rivers Trust General-ID-Sheet. 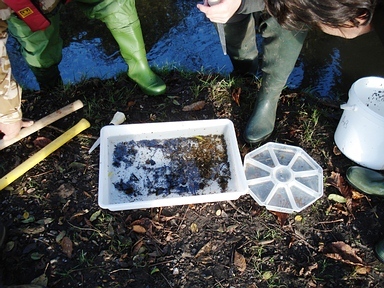 In 2014 The Chilterns and Hertfordshire Riverfly Hub was established by the Chilterns Chalk Streams Project and the Herts and Middlesex Wildlife Trust to provide ARMI (Anglers’ Riverfly Monitoring Initiative) training to anyone wishing to monitor the health of rivers in the Hertfordshire, Middlesex and Chilterns areas. ARMI was established in the UK in 2007 and is coordinated by the Riverfly Partnership. The ARMI network has developed significant coverage all across the UK river systems and, coupled with frequent surveys, protects the water quality of our rivers as well as understanding riverfly populations and conserving riverfly habitats. In April 2017 the Freshwater Biological Association took over as the Riverfly Partnership host. For more information on ARMI and how angling, and other interested) groups, are playing an instrumental role in protecting the health of local rivers by monitoring their riverfly populations. The ARMI monitoring technique involves pairs of volunteers taking 3-minute kick samples from the river bed each month, and recording the presence and abundance of eight pollution-sensitive invertebrate groups. Bourne End Recreation Ground, Bourne End.